A record enthusiast and collector from her teenage years, Diggs started her journey as a DJ with the acquisition of her first set of turntables at age 17. Since then she has gone on to play at some of the hottest parties and alongside some of the best DJs and artists in the business. As resident of New York City's premiere all-vinyl 45 party, Mobile Mondays! Diggs has become a force to be reckoned with and one of the most sought-after DJs in the world. 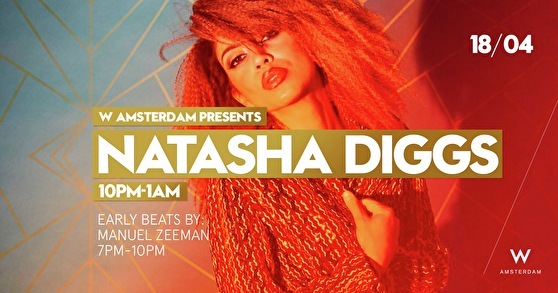 Natasha’s deep knowledge of music and vinyl collection has enabled her to rock diverse crowds around the globe and on any given night her sets might dip into hip hop, soul, funk, latin, rock, house, reggae, afro-brazilian, disco, and beyond. Manuel Zeeman, aka Smooth Talkin, is a Dutch-Portuguese hybrid residing in Amsterdam who, among a whole set of creative activities, has also been a DJ in the active for about 15 years. His double nationality, wide range of occupations designer, visual artist, photographer and now also the W Amsterdam music curator. His relentless curiosity often come together in colorful, moving DJ sets, mixing and exploring genres that go from soul, hip-hop, afro beat to funk, disco, house, deep house and deep techno. Get yourself ready to dance off to their best beats and remixes in W Lounge Amsterdam.